Our WPF PropertyGrid control is an extremely powerful way to edit the properties of any object. While a lot of PropertyGrid usage is for basic properties such as numbers, strings, dates, etc., properties can be of any custom Type as well. In our most recent release of the WPF controls, we created a new custom property editor sample that shows how to easily add a custom property editor for a certain Type. The screenshot above shows how a custom enumeration named OnOffAuto was created. The object being edited in the PropertyGrid has several properties that are of that type. We defined in XAML a custom template that uses our HorizontalListBox control to allow for easy selection of the options. 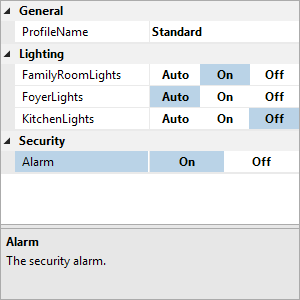 In the case of the Security Alarm property, we made a further customized property editor template that only shows two of the options instead of all three. This specialized template is configured to only apply to that one specific property. While this sample shows how to make a custom property editor for an enumeration type, the same concepts can be applied to any custom type. In recent builds, we have further improved the editing experience when using PropertyGrid. We added built-in property editors for font-related properties. We added support so that double-clicking a property name will cycle through any standard value options that the property has. In the event that the property doesn't support standard values, double-clicking the property name will attempt to focus the related editor instead and select all text if possible. Download the latest build of our WPF controls to see this new sample and obtain the latest editing features. In today's post I'd like to show off another new feature that was added to SyntaxEditor (WPF, Silverlight, and WinRT/XAML platforms) in its 2014.2 version: quote delimiter auto-completion. SyntaxEditor already had some great delimiter-related features like delimiter highlighting and delimiter auto-completion for curly braces, square braces, and parentheses. These have been in the product for a while. We had a number of customers also request that support for quote auto-completion be added to assist with working with strings, and that's what's been added. Quote auto-completion support is now built into the DelimiterAutoCompleter class, with double quote completion enabled by default. Single quote completion can be activated as well but is not enabled by default since some languages use single quotes as single line comment delimiters. The end double quote is auto-inserted, but after the caret. This allows me to type the string content directly in without having to use arrow keys. Now that I've typed in the string content, I type the double quote again. SyntaxEditor knows that it's the quote that was recently auto-completed, so it effectively overwrites the existing quote instead of adding another double quote. The caret ends up after the string, as expected. The quote delimiter auto-completion features were added in the 2014.2 version of our WPF, Silverlight, and WinRT/XAML controls. 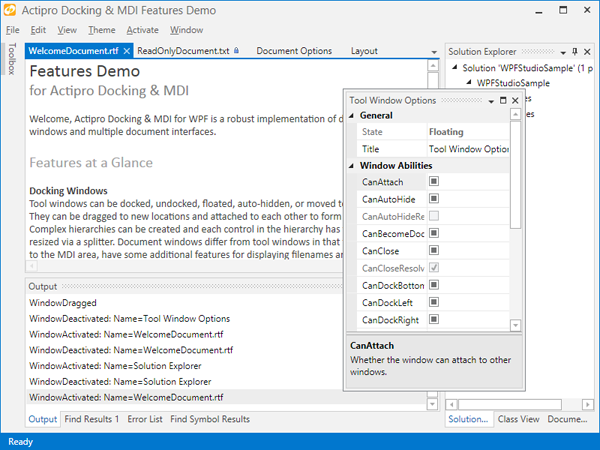 In this quarter, we published the 2014.2 versions of our WPF, Silverlight, and WinRT/XAML controls. These versions included several new controls, a new Python Language Add-on for SyntaxEditor, and some big feature enhancements for our existing controls. Check out the release posts for more detail. One big piece of the new WinRT/XAML control updates was that we made all our controls universal controls, compatible with both Windows Store 8.1 apps and Windows Phone 8.1 apps. I want to also call particular attention to our new Editors controls that we custom developed for use in Windows Store and Windows Phone apps. The editors use some brand new unique designs that allow users to efficiently enter data with keyboard, mouse, or touch. Be sure to check those out! Our Code Writer app received some nice updates as well. We're now working on more v2014.2 updates for our existing controls and on some new controls as well.